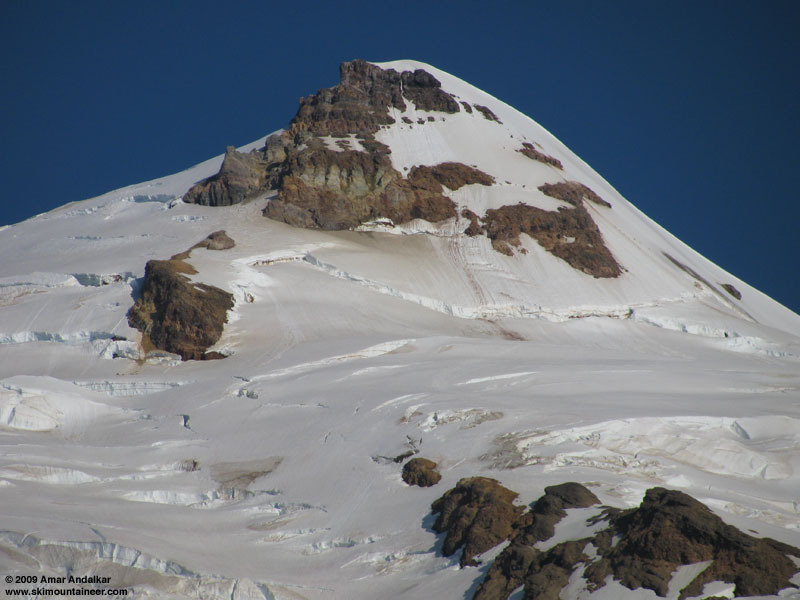 Summary: Dave Brown and I climbed Mount Baker and skied from the summit via the Boulder-Park Cleaver and Boulder Glacier, enjoying a magnificent run of over 6000 vertical feet in mid-July. 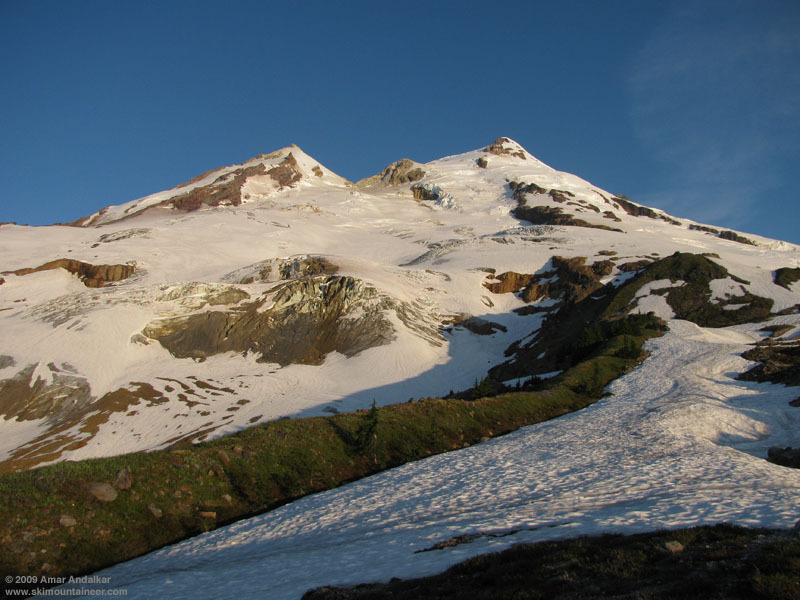 The route remains in good condition for skiing, with continuous snow from within a few feet of the 10781 ft summit all the way down to 4700 ft along Boulder Ridge, just above the fixed rope scaling the cliff at the end of the climbers trail. The Boulder Ridge Trail is in typically wet, muddy, swampy, overgrown condition, not fun with skis and boots on the pack. On the upper mountain, the snow below 9000 ft is well-consolidated and still fairly smooth, with minimal incipient suncups and only a few isolated areas of deeper suncups and runnels. Above 9000 ft there is considerable new snow which has fallen during the last week, perhaps up to 2 ft deep in spots above 10000 ft, and this recent snow has not fully consolidated yet, softening into deep mush in the current warm spell. 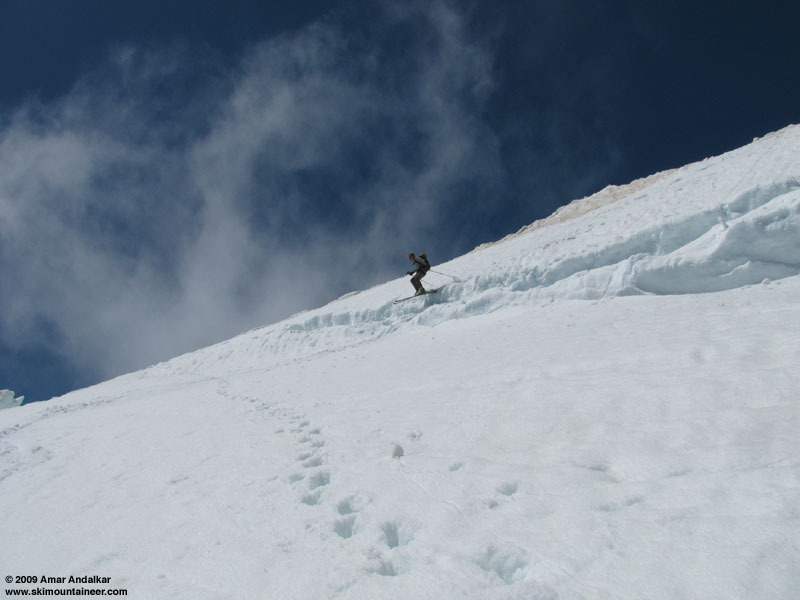 Several hazardous crevasses must be crossed on the upper part of the route above about 9800 ft, and a rope was helpful for peace of mind, especially with the mushy snow conditions. These crevasses may quickly open into formidable obstacles during the ongoing warm weather. Sunrise on the Boulder Glacier, seen from camp near 5100 ft on Boulder Ridge. Zoomed view of the uppermost part of Boulder-Park Cleaver and the edge of the Park Headwall. Dave jumping a crevasse near 10200 ft on the Boulder Glacier. Details: Longer report and�more photos to follow . . . maybe . . . When up yesterday, got whited out. Whatch out the border patrol.